Scoppio del Carro – These aren't gray hairs, these are highlights! As Easter mornings go, this one was pretty spectacular! I attended the Scoppio del Carro (‘Explosion of the Cart’), something I’ve wanted to do since I read about it a year ago. The morning started at Via Il Prato, where the cart starts its journey to the Piazza del Duomo. The cart is pulled by white oxen. They are very tolerant to put up with the festive headdresses! 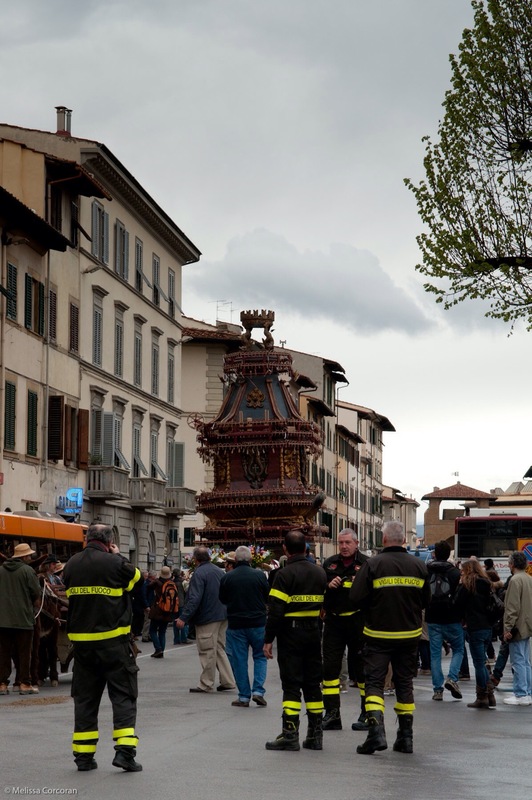 I followed along with the procession for a few blocks, then headed towards the Duomo. Passing through the Piazza della Repubblica, I was thrilled to see the Sbandieratori, the city flag throwers. After a cioccolata calda, I found a place to stand and wait for the cart to arrive in front of the Duomo. When it did arrive, it was accompanied by marchers, including musicians, in period costumes of the Florentine Republic. Pictures of the marchers were hard to get, due to the crowds, but trust me, the spectacle was amazing. A few finishing touches were put on the cart. Those dangling paper packets are the fireworks. The coat of arms is that of the Pazzi family. The fireworks began at 11:00, when the Gloria was being sung during the Easter Sunday Mass inside the Duomo. A mechanical dove flew from the altar to the cart along a wire to ignite the fireworks. Hmmm, am I taking photos of the fireworks or of people’s cellphones? And at the end, the flags. All images © Melissa Corcoran.